We had the opportunity to facilitate a review for Gears! Gears! Gears! Sweet Shop Building Set from Learning Resources. I like toys for children that are not only fun but incorporate learning. Of course, without my children knowing that, shh don't tell them. Learning Resources is the go to place for fun toys with educational value. 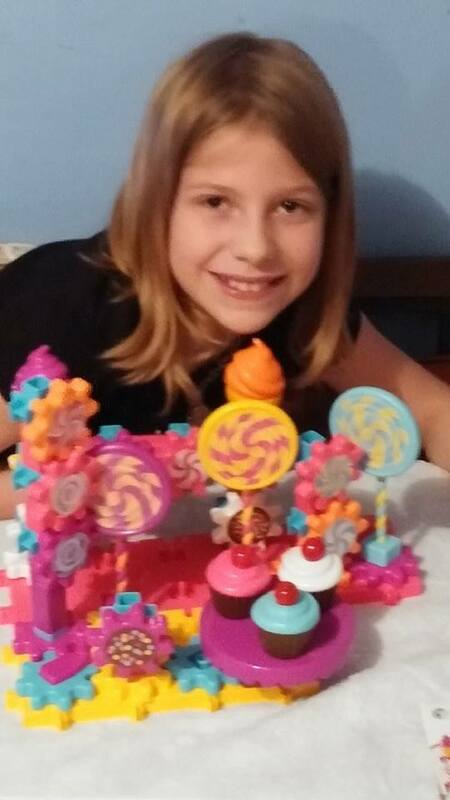 My sweet girl was super excited to get her hands on the Gears, Gears, Gears Sweet Shop Building Set we received. She already owns one, so she knew about what to expect. She got busy right away with all the stickers, and putting them on the pieces. What is very nice about these sets is if you own one, and get another, they are compatible with each other. The pieces are chunky, making the set perfect for her not yet grown up hands. The gears are super easy to put together. There are are many different ways these connect and with a twist of the gears the lollipops, ice cream cones, and cupcakes twirl and swirl! This set includes 82 brightly colored pieces! Included are cupcakes, ice cream cones, lollipops, stickers and of course the gears. As I said, the set will mix and match with other Gears! Gears! Gears! Building Sets. These sets are extremely well made and durable. The pieces are easy to clean. This set is recommended for children 4 and up. Don't let the brightly colored ice cream cones and lollipops fool you, not only will your little girls love it but most likely your little boys will also. Our boys love to sit and play with the set too. Isn't it wonderful to watch your children's little minds at work while their hands get creative? I absolutely enjoy watching my kids come up with awesome builds. Who knows, maybe I have an engineer in the bunch. With another baby on the way, I am quite confident that these durable sets will last through hours of play and even be around when the next is old enough to explore and build with their hands. Learning Resources offers over 1100 high quality products that are sold in more than 80 countries. They offer educational toys you can select by age/grade, subject category, brand, special needs, and teacher resources. Learning Resources is a leading manufacture of innovative, hands-on, educational materials for learning toys and classrooms worldwide. The Gears! Gears! Gears! Sweet Shop Building Set is perfect to encourage fine motor skills and creativity in little ones. Let your child's imaginations run wild! You can connect with Learning Resources via Facebook , @LearningHandsOn , Pinterest , Google + , Instagram , You Tube https://www.learningresources.com/ and Learning Resources Website . My 7 year old granddaughter would be intrigued with this. i love that this is an educational toy that is the only kind I buy. This is so cute. My granddaughter would love to see this one under the Christmas tree. Thank you for the entry. I love that Learning Resources allows you to age/grade, and/or special needs. It makes navigating their site so easy. I also love this gears set and think my granddaughters would as well! This would make a wonderful gift for my daughter. I like how it incorporates building and engineering with play. This looks like it would be a neat gift for the holidays for little girls who love to play! I love Learning Resources, they have so many awesome educational toys! My son loves building stuff, he'd absolutely love this set! to create something that only they can by using there own images. I think this is a toy my niece would love. The bright colors are very attractive. This is something my grandkids would really enjoy. They love building things. Good for their little minds too. My daughter would love the Gears! Gears! Gears! Sweet Shop Building Set. She loves building things and it is very unique building set.